You might ask, “Do you have to devein shrimp?” The reason that the vein is usually removed is because the dark vein is not only unattractive, especially in large shrimp, but it can also sometimes contain sand. If the shrimp is small or medium-size you may skip this step to save time. 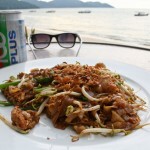 Malaysia’s char kway teow, fried rice noodles with seafood and egg, is similar to Thailand’s Pad See Ew. Join Kaitlyn as she enjoys the food and the beaches on the Malaysian island of Penang. 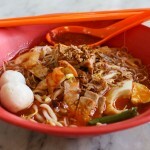 This Penang Hokkien Mee – prawn noodle soup – is a street hawker favorite, made of a seafood broth and topped with slivers of pork and crispy fried onions. The latest photo from Kaitlyn Moore as she explores the delicious street food available on the tropical island of Penang, Malaysia. The new ambassador to Thailand Kristie Kenney loves Thai Food. 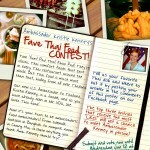 She has set up a Facebook competition asking people to share their favorite dishes and the prize is to meet the incoming ambassador in person in Bangkok.